There are several types of air cleaning devices that work hand in hand with your central heating and air conditioning system, each designed to remove certain types of pollutants. Particulate matter includes dust, pollen, animal dander, tobacco smoke as well as particles associated with tiny organisms like dust mites, bacteria and viruses. Gaseous pollutants come from combustion processes including gas stoves, vehicle exhaust and tobacco smoke. They also come from building materials, cleaning products and pesticides. The options below used by themselves are effective, but in combination, provide a fantastic solution for those suffering from asthma, allergies or other breathing issues. “High efficiency” allergen filters that are available over the counter at do-it-yourself stores can actually harm your heating and air system by restricting the air flow. Good air flow is crucial for the long term reliability of your equipment. 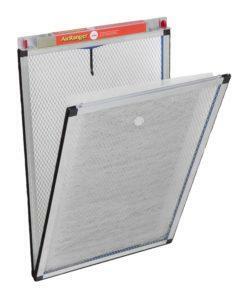 Bonney can install a 4 or 5 inch filter that effectively cleans the air without reducing the air flow. These filters use a process called electrostatic attraction to reduce the number of airborne contaminants in your home. 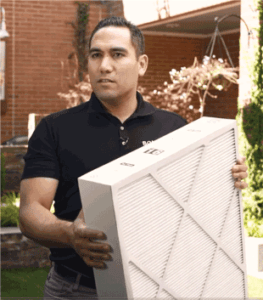 As air passes through your heating and cooling system, it traps large particles, like dust and dander, in a prefilter. Then, electrically charged filters attract and trap smaller particles, such as bacteria, to prevent them from recirculating through your home. Irradiate and neutralize bacteria and airborne viruses while freshening the air you breathe with a whole house air purification system. 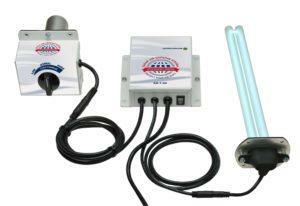 It installs directly into your central heating and cooling system’s ductwork or plenum. According to the EPA, the combined use of filtration and germicidal UVC light is an effective means of preventing the distribution of airborne viruses in occupied spaces. Are you looking for a solution to increase your indoor air quality? Then call Bonney today for a free customized estimate!